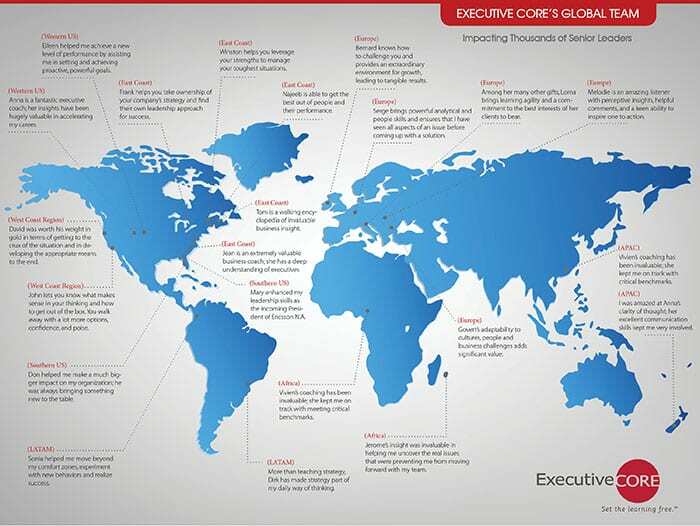 Our international cadre impacts clients all over the world. We have 150 consultants positively impacting thousands of leaders globally every year. See what our clients say about some of our global team members. Hear what our team can do for your leaders. Susan Vance-Johnson is an executive coach and organization development consultant with more than 25 years of leadership experience in business and human resources roles. An expert in governance and management, her focus areas are in Business Strategy, Leadership Development, Executive Coaching, Cross-Cultural Communication, and Talent Management Strategy. Winston Lau earns the respect of senior leaders who appreciate his experience as a successful CEO and willingness to help others accelerate their careers. He is a consultant with more than 25 years of international corporate executive experience and more than 10 years of international consulting experience in developing leaders who drive organizational performance. His specialty areas include executive leadership development and coaching, team leadership, cross-cultural awareness and change management. He has coached at all levels of organizations, from CEO to star individual contributors. Winston’s strength as a consultant lies in his ability to communicate with great credibility and conviction backed by insights gained from his extensive executive experience. He is able to help individuals to develop leadership competencies and enhance performance by delivering tough messages while offering real-world perspectives. He has worked extensively with clients in manufacturing, distribution, chemical, industrial and consumer products. Anna Pool offers more than 20 years’ experience of talent management consulting, executive education, and executive coaching. She is an experienced and agile organizational consultant and executive coach with a focus on developing talent and organizational culture to drive the company’s strategic enablement, bench strength, and ability to excel in the global marketplace. Anna has coached at all levels of organizations, from CEO to star individual contributors. A seasoned business professional, Anna has facilitated leadership development, executive education, and executive coaching across a broad range of industries. Her expertise lies in transition coaching, individual leader and team activation sessions, organizational culture development, executive education and alignment, and strategic planning with meaningful results-oriented metrics. Najeeb has deep experience in strategy, talent management, leadership coaching, employee development, talent acquisition, organizational development, team effectiveness, group facilitation and change management. He has had significant involvement with global business operations in multiple industries, with a focus on leveraging intercultural effectiveness to drive business performance. Najeeb has successfully served leaders from all levels in organization—from first-line supervisors to the C-Suite. Through rapid organizational growth, downsizings, restructurings, and other business transformations, Najeeb has developed hands-on expertise that couples sound theory and research with practical applications that work. Anna Harper is an executive coach, leadership & management consultant and organizational shape shifter (systems change agent) with more than 30 years of international experience at senior levels across a range of industries. With more than 30 years in the business environment, including 14 years living and working as an executive in Southeast and Northeast Asia, Anna understands the complexity of achieving business objectives across cultural borders. She has coached at all levels of organizations, from CEO to star individual contributors. She has served a range of industries including: business technology communications; automobiles; pharmaceuticals and healthcare; banking, finance and insurance; consumer goods; defense; airlines; advertising; logistics and mining. She has achieved a worldwide reputation for her innovative approach and reliability in achieving results that shift perspectives. Angus Reynolds has over thirty years experience in corporate strategy and human talent management.. His colleagues on top-management teams sought out Angus for his ability to grow highly productive, effective, and satisfied teams. Today, he takes works globally with Fortune 100 companies in a variety of industries including financial services, consumer goods, technology, and medical devices.